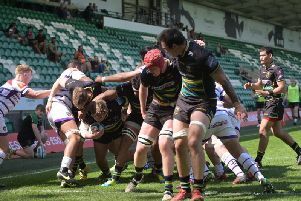 Alex King hailed Saints’ new boys after the crushing pre-season win at Saracens on Saturday. Jamie Gibson, a summer recruit from Leicester Tigers, was among the scorers in the 36-17 victory at Allianz Park. JJ Hanrahan landed a penalty and conversion in his first appearance since switching from Munster, while Paul Hill, Tom Kessell, Luke Eves and Pat Howard also played a part. And attack coach King was delighted with how the fresh faces fitted into a strong Saints squad. “We got a lot out of it, a lot of the new guys stepped up and put in a really good performance for the first time in this shirt,” King said. “We move on to Wasps next Sunday and it’s a really good start. “It was just great to get that first game. “The boys have worked incredibly hard for 12, 13 weeks now and by the way we’re training it is getting a bit heated and it’s important we got a run-out. Luther Burrell dotted down twice, while Howard Packman and Tom Collins were other first-half scorers before Gibson rounded things off in the second. And King added: “With the likes of Ken and George (Pisi) away with the World Cup, the likes of Howard Packman and Tom Collins get their chance and they took their tries really well. “Jamie Gibson’s was a great team try, started by Howard up the middle and controlled by the half-backs. “I thought Tommy Kessell made a really good impact when he came on.